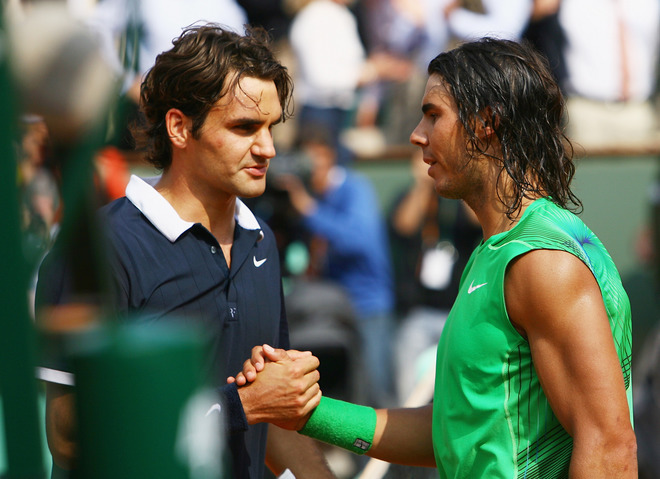 this morning rafael nadal and roger federer fittingly faced off in the final of the french open. (i know alliteration impresses brian, and i want him to think that i’m a decent writer.) this is the third straight year where nadal and federer played each other in the final. the year before, nadal beat federer in the semifinal. last year rafael nadal didn’t drop any sets on the way to the final before beating roger federer 3-1. then in wimbledon federer won 3-2 in one of the most incredible matches i’ve ever watched. so this year i figured would be a close one. both federer and nadal were playing the best clay court tennis of their careers. federer had only dropped 3 sets before the final and nadal had again not lost any. the match wasn’t close at all. nadal got an early lead and broke federer twice in the first set to win it 6-1. roger f. was down 2-0 in the second set and put together a good twenty minutes of tennis with some stunning winners to tie it up at 2-2. each held serve and then rafael n. went crazy, winning the next 9 games to finish the match in around 2 hours. i figured the match would last a lot longer. i’d planned my whole morning around watching tennis and found myself with a lot of free time. luckily, there was another competition going on: robonaut vs. athlete. 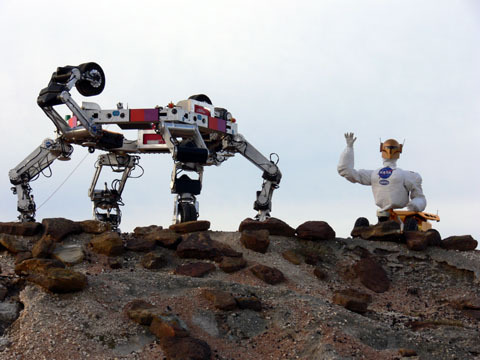 robonaut is a humanoid robot designed by nasa to be able to perform extra-vehicular activities (i.e. space-walks). it has a torso shaped like a human with arms and hands and a helmet that looks like boba fett. the helmet has two eyes, so that visual relays can provide depth. the arms have a total of 14 degrees of freedom each: 2 in each wrist and 12 in each hand. 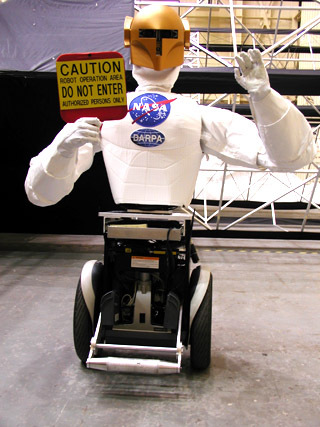 this gives the robonaut a surprising amount of dexterity, which in turn enables robonaut to perform tasks that were not designed to be handled by robots. the size of the hands is roughly the same size as a suited astronauts hands, so robonaut can get to those hard-to-reach areas (much like a nice toothbrush). the torso can be placed in a number of lower “bodies” depending on the required task. 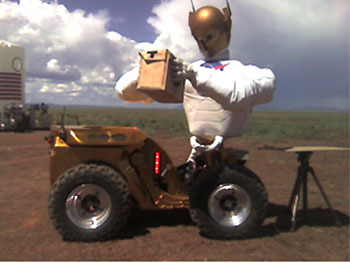 the two that i’ve seen is the segway robonaut where he has a segway for legs and the centaur robonaut where he “sits” on a 4-wheeler of sorts. 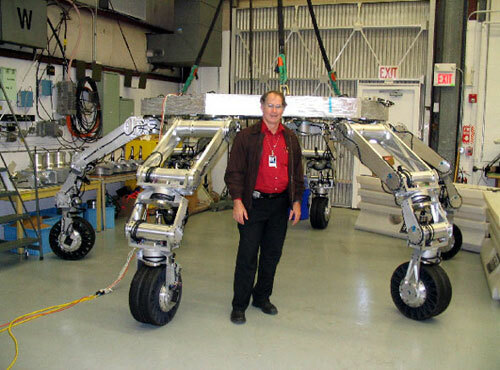 athlete is a six-legged robotic lunar rover. athlete stands for All-Terrain Hex-Legged Extra-Terrestrial Explorer. the athlete is 4 meters in diameter and can stand 6 meters tall. each of the six legs has six degrees of freedom. 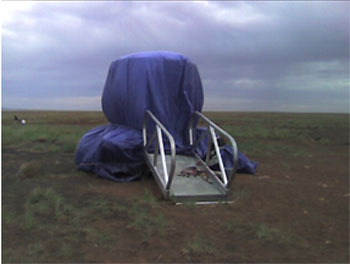 athlete can roll along or walk, depending on the terrain, and is capable of sustaining a load of 450 kg. multiple athletes can be docked together to form what some call ultrathlete, which i can only imagine stands for Ultimate Laterally-TetheRed All-Terrain Hex-Legged Extra-Terrestrial Explorers. 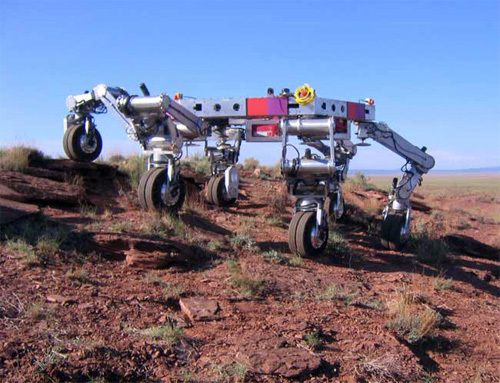 it can move over 10 kmh on terrain like that of the moon, 100 times faster than the mars rover, and can climb 35 degree inclines of rocks. 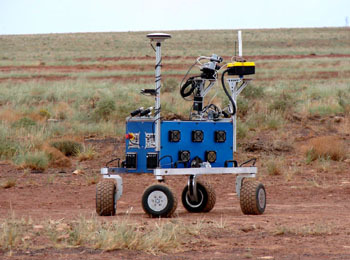 the competition of interest is a race up to the top of a hill in a crater in arizona, which is essentially a simulation of robot racing on the moon or on mars, which will become widely popular in the late 21st century. the competitors arrived early. 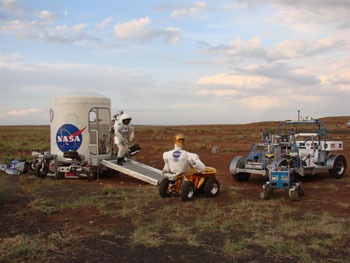 athlete on the left, robonaut in the middle, k-10 on the right with scout right behind k-10. the suited astronaut was the ref. after a brief rain delay, k-10, robonaut and athlete are ready to go. robonaut shows off his dexterity with a little bit of a cheap move, tying athlete to an anchored stake. and then remembers that it is not capable of climbing hills. 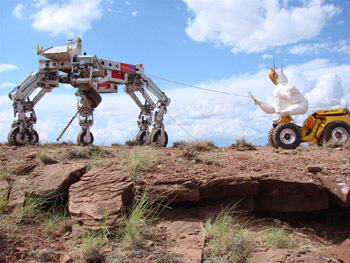 with athlete tied to a stake, robonaut takes off up the hill. athlete finally breaks loose and heads for the steepest part of the hill, in hopes of cutting off robonaut’s path. 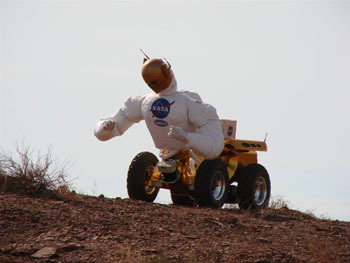 athlete passes robonaut, since hill-climbing is its strong-suit. but robonaut has some more tricks up his sleeve. he hooks a tether-line to athlete and catches a ride during the last quarter of the hill. 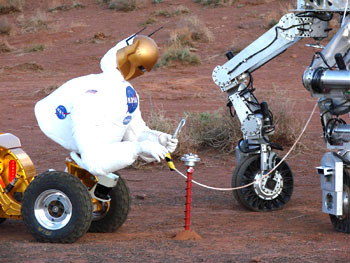 robonaut takes advantage of its understanding of the slingshot maneuver to swing past athlete for the victory. robonaut wins and gets its picture taken with athlete. but what robonaut didn’t know is that there was no prize. they give robonaut a box with the label “trophy” and robonaut opens it up, only to be embarrassed in front of all its friends. but what about gravity? isn’t the gravity going to be different on mars or the moon? did they even mention that?